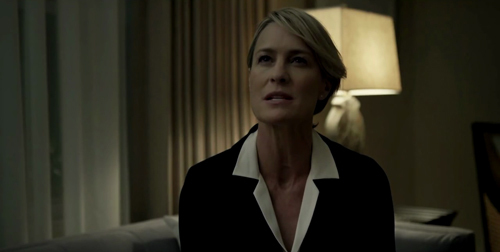 (SPOILERS) Well, it’s a massive step up from the middling third season, mostly hitting its targets in making Claire (Robin Wright) as steely and reptilian as President Frank (Kevin Spacey). 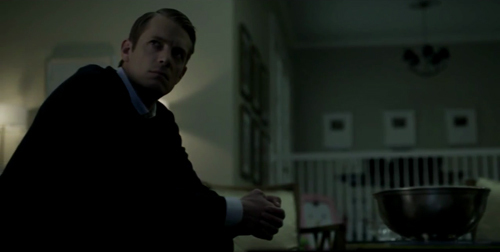 As such, Season Four of House of Cards is somewhat superior in the first half, when the Underwoods are at sabotaging loggerheads with each other, rather than the resumption of the new united front in opposition of Republican, selfie-obsessed pretty boy Will Conway (Joel Kinnaman) in the second. It’s a particularly nice touch to have her stare into the camera in the final shot too. 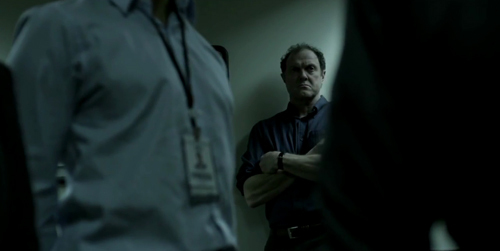 Mostly this show is as politically disconnected a fantasy as The West Wing, merely replacing altruistic motives with Machiavellian ones. 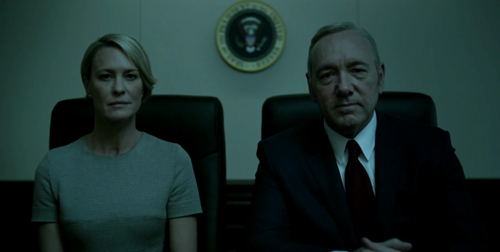 Frank and Claire have no one calling their shots, perpetuating the notion of an Oval Office that actually issues edicts and exerts control. But there are occasional neat touches along the way. If Conway’s strangely garbled Google-esque search engine election-rigging formula never really convinces as anything that would work (which is probably why the writers are so vague about what exactly Pollyhop can do and how it keeps him ahead), and Frank’s countermeasures CIA surveillance is a crude grab at invoking Snowden topicality without really being remotely relevant, and ICO is just the latest forlorn attempt at making capital from a fictionalised War on Terror, at least the final curtain, as the President, backed into a corner, goes to war as the only way out, is appropriately, ruthlessly cynical (“We don’t submit to terror. We make the terror”). The only problem is that, for every time the makers come up with something neat, they miss something even better. I fooled myself for about 10 minutes into thinking the hostage abduction might be a false flag designed to gain capital as part of a ruse to undermine Conway, but it was just more sub-Homeland terrorists-on-home-turf nonsense. 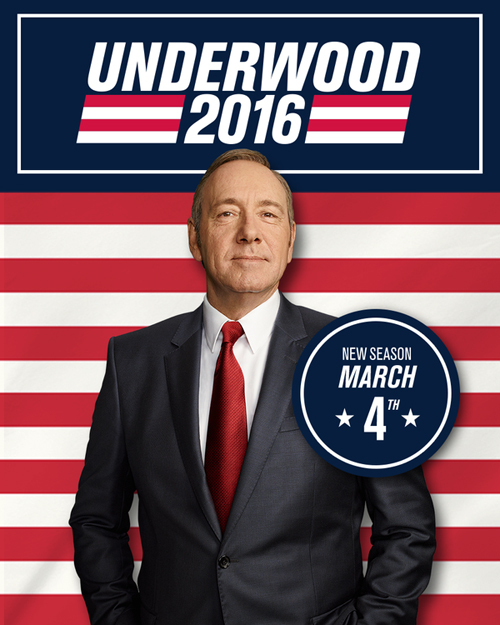 The Frank and Claire Show, with her running for VP (the kind of unlikely conceit that actually just might work, given public appetites for gloss over substance, but just as likely really wouldn’t – you’d have to completely love them as a celebrity couple to get public onside) looks more and more like a parallel with the Clintons, with all the skeletons attempting to break open the closet doors. Against that, her relationship with Tom Yates (Paul Sparks) is a little laboured, and the kind of thing, in its extended form as the US show is, that reminds you this kind of material works so much better as a finite, focussed satire; that they’re wrapping it up after five seasons is probably as much about Spacey wanting to do other things as getting out while the going is good and there are still a few storylines left to plot. 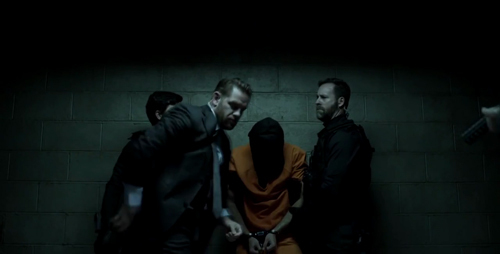 The assassination attempt on Frank made for good dramatic capital for a few episodes, even if I never really bought into Lucas (Sebastian Arcelus) being brought to the brink, and the whole deathbed hallucinations thing was dreadfully overplayed. Which lead into the Big Bad of the season, and, while his arsenal of hooks isn’t terribly convincing, Kinnaman really delivers as Conway; it’s one of the best roles he’s had, in fact. 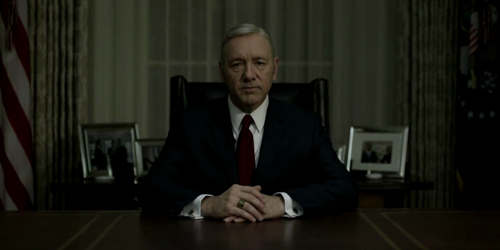 But, while House of Cards manages to be more-ish in a manner a number of Netflix shows just plain aren’t (the Marvel run, and I’ve mentioned I’m really struggling to summon enthusiasm for Bloodline Season Two), and it’s nice that it leaves characters for a while and then returns to them, there is a sense that rather than a shrewdly devised and calculated schematic for a show that wants to be as elegant and poised as this one, it’s actually going around in a lot of circles (Boris McGiver’s Tom Hammerschmidt picking up the investigation into Frank again), often spinning its wheels and patching up holes rather than ploughing ahead with intent. What I’d have liked more of is the unlikely, and the idiosyncratic, like the Damian Young’s offbeat NSA data scientist listening to rap on his headphones as he fucks people’s lives up. The show has definitely proved it works best when making the Underwoods devilish equals, be that as opposing forces or working symbiotically, showing off both sides at various stages of the season. So, however the final chapter goes, and possibly nervously so without Beau Beaumont running things anymore, it needs to keep that in focus.